Retractable awnings are great options for those looking for flexibility in their awning design. If you’re looking to have a retractable awning installed at your home or business, there are a couple of things you’ll need to think about. Whereas regular awnings are designed to stay in their place year-round, retractable awnings can be taken down and stored when not in use. 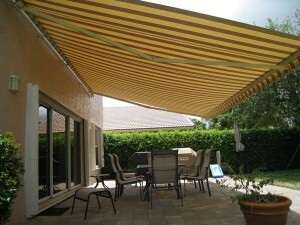 Retractable awnings also come in two varieties: motorized and manual. Which one is right for you and your needs? Today we’re going to explain the benefits of each variety. Manual retractable awnings are opened and closed through the use of a hand crank or handle. They do not require much strength to operate and they will work even if the power goes out. This makes them very valuable during the summer time – if the power and air conditioning go out in your home, you can open your awning to protect your home from the heat of the sun. Because they are operated manually, there are no mechanical problems to worry about and the maintenance required is minimal compared to motorized awnings. They are easy to install and have added support through the use of vertical rods. On the other hand, you may find that going with a motorized retractable awning may be preferable for your needs. This kind of retractable awning uses a small electric motor to unfurl and retract the fabric. This method is less time-consuming and strenuous than a manual awning. Motorized awnings look more modern and have some additional technology over manual awnings. They can have sensors installed to detect wind motion and can even retract automatically if the wind is sufficiently high. They can also have sensors that detect the heat of the sun to automatically control the shading and cooling effect of your awning. This may help you lower your energy bills. Both kinds of retractable awnings can help you make your outdoor space more inviting. Your decision may be impacted by your budget or your unique needs. Some prefer manual retractables because they don’t want to deal with wiring issues. Others prefer the convenience of motorized retractables. You can’t go wrong with either option if you want to add class and curb appeal to your home or business!